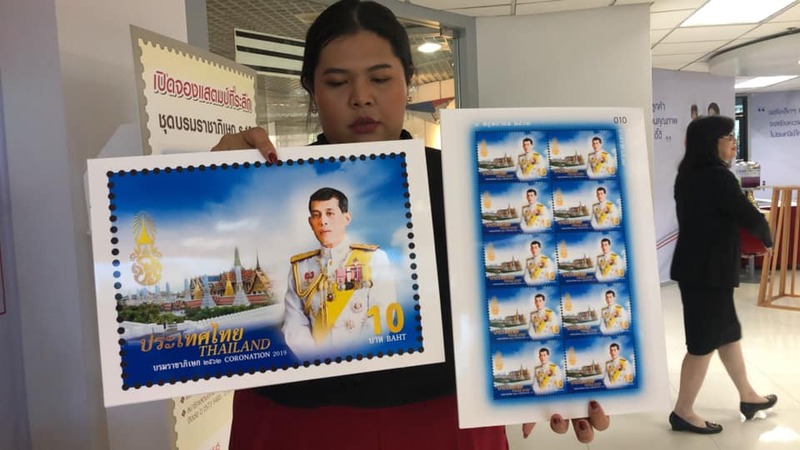 Late this afternoon, March 14, Thailand Post revealed the design for the single 10-baht stamp commemorating the Coronation of His Majesty King Maha Vajiralongkorn Bodindradebayavarangkun (มหาวชิราลงกรณ บดินทรเทพยวรางกูร), the Tenth of the Chakri Dynasty. 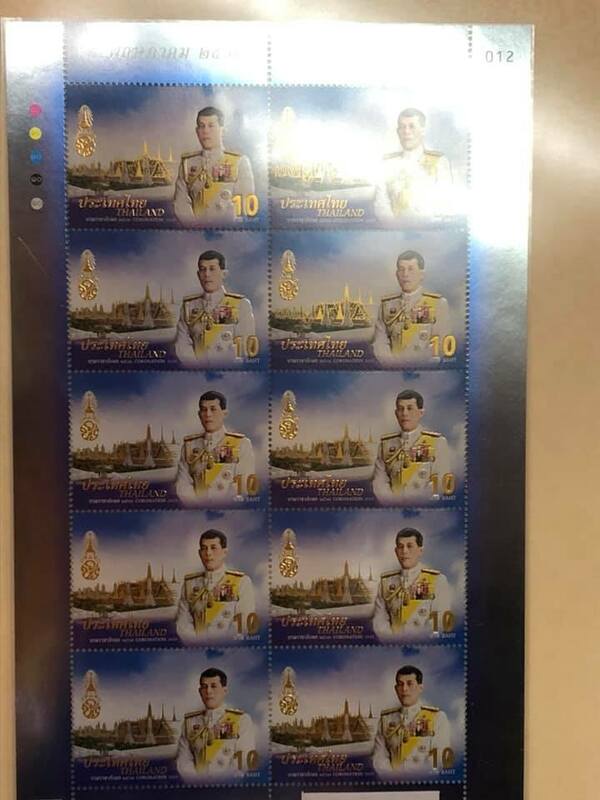 This followed the unveiling earlier this week (March 11) of the Royal Coronation Emblem which is portrayed on the stamp along with a portrait of the King wearing his Royal Thai Army uniform. An image of the Royal Grand Palace in Bangkok can be seen in the background. 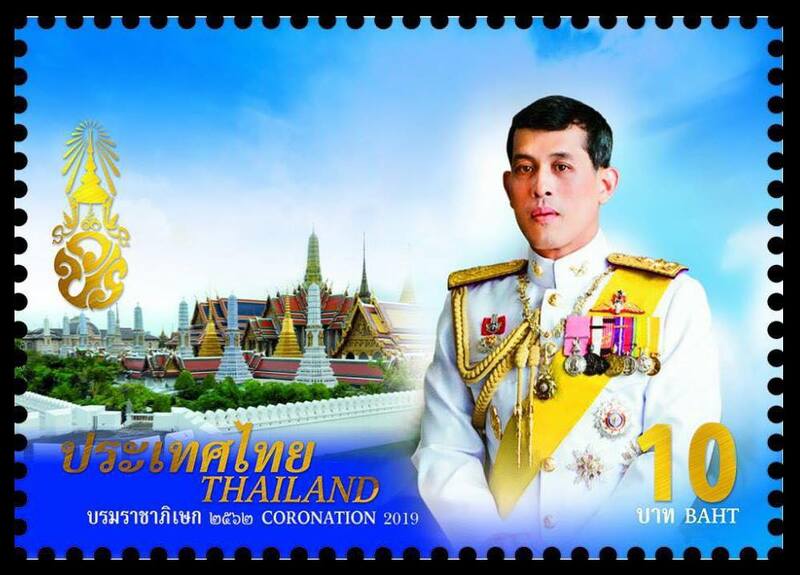 The stamp design is meant to echo that of the set of eight stamps issued to mark the coronation of Rama X’s father, the late King Bhumiphol Adulaydej, on May 5, 1950 (Scott #275-282). His Majesty the King personally gave the final approval to the stamp design. Three million copies of the stamps have been printed and are claimed to be the first in the world to utilize a special four-color glass foil printing technique. This has been used on the lettering for the country’s name, denomination, and Royal Coronation Emblem which produces an embossed effect. 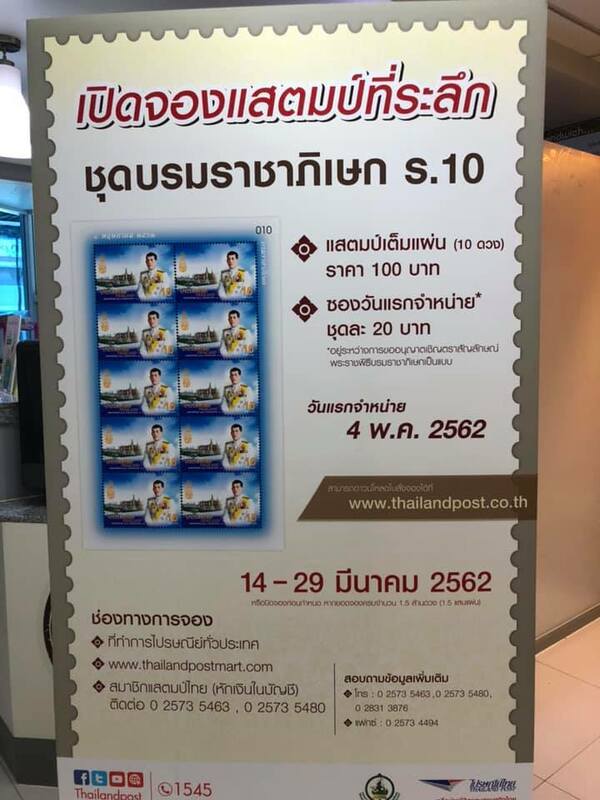 Preorder reservations for first day covers began today and will continue until March 29 at a price of 20 baht per cover at www.thailandpostmart.com. More information can be found on the Thailand Post website or by phoning THP Contact Center 1545. The lead-up to the Coronation will begin with a water-drawing rite conducted by the governors of each of Thailand’s 77 provinces on April 6. This water will be consecrated the following Monday and Tuesday and then transported to Wat Suthat Thepphawararam in Bangkok for further purification on April 18 and then taken by procession the following day to the Temple of the Emerald Buddha. A number of other pre-coronation rites follow and the three days from May 4 to 6 are full of additional ceremonies. A royal barge procession is expected during the Royal Krathin ceremonies later in the year (October or November, probably). A detailed explanation behind many of these, as well as a schedule, can be found in the article “The Crowing of A King” published by The Nation on March 2, 2019, That article mentions that the Ministry of Culture website includes free downloadable guides to the Coronation ceremonies but I have yet to find them. The Royal Emblem marked the upcoming Coronation of His Majesty King Vajiralongkorn (Rama X) which will be held on 4-6 May 2019, contains the King’s monogram in the white trimmed with gold in the centre. 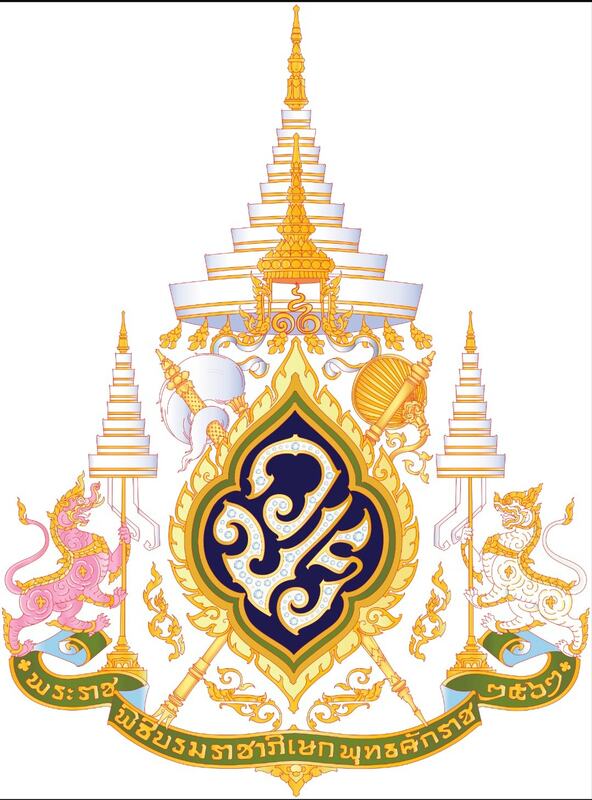 The Royal Cypher is decorated with diamonds which denote the origin from which his name is derived, whilst the gold trimming of the cypher represents the colour of Monday when he was born, according to the Thai traditional colours of the day. The Great Crown of Victory, represents the great burden bearing down on the King for the sake of his people’s happiness. The Sword of Victory, symbolises the King’s responsibility to protect the Kingdom from all harms threatening. The Royal Sceptre, signifies the King’s virtues to bring forth peace and stability to the Kingdom. The Royal Whisk and Royal Fan, symbolise the King’s righteousness as a ruler in relieving the suffering and hardship of his duties. The Royal Slippers, represent the King’s care in fostering the sustenance and welfare throughout the Kingdom. The Great Crown of Victory with the Unalome insignia includes within the sequence of number of this reign. The sword and whisk lie on the right, while the scepter and fan on the left. And below the cypher rest the royal slippers. Standing behind the Crown is the Great Umbrella of State trimmed with bands of gold. The nine-tiered umbrella has the lotus bud finial showing Brahma Faces on top, while the lowest tier is decorated with golden Champa bouquets representing the extension in all directions yonder of his writ and authority. On the lowest part stretches of green-gold ribbon, trimmed in gold, bearing the Thai language phrase which is translated as: “The Coronation, 2562 B.E. (2019 A.D.)”. On the tip of the ribbon stands the purple Kojasi lion, holding up the seven-tiered umbrella representing the Armed Forces, while the white Ratchasi lion holds the same but represents the Civil Service. Altogether represent the two pillars of public service. Inside the shafts of both umbrellas have golden Naga snake traceries denoting the year of the dragon, which defines the King’s birthyear according to the traditional belief. The golden colour of Naga traceries signifies the prosperity of the nation and her people.